The modern art form of landing page design, and associated science of landing page optimization is creating a generation of whole-brain marketers – equally obsessed by creating the magic of emotional impetus in the user, and playing the established odds for the greatest likelihood of success. At the centre of this effort is the ongoing mission to create incredibly effective calls to action (CTAs) that convert warm prospects into customers, browsers into buyers. Creating effective CTAs is by no means simple. And what works for one website may not for another. There’s only one way to know for sure that your call to action is really calling effectively – and that’s to continually test and improve it. However, the volume of variables to be tested and tools available to test them can be paralyzing. You can A/B test the color of your buttons, their position on the page, the text used within them, the graphical cues drawing attention to them, font styles and sizes, shadows and shading, dotted and solid lines, neighbouring content…the list is never ending. How do you see the wood for the trees? 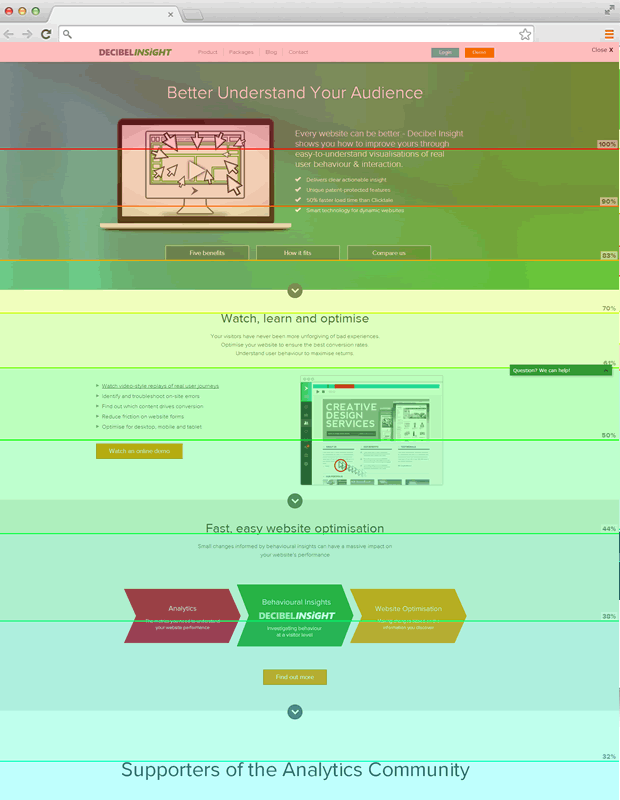 Here are three ways that using website heatmaps can help to show you where to start on your journey of optimization. Your landing page should focus visitors on a clear, singular call to action. There should be no confusion or distraction from that goal. But no matter how much you want your users to grasp your meaning and head compliantly towards the ‘check out now’ button, they are human beings and therefore fundamentally curious, contrary and unpredictable. They will search for more information and seek their own path through your website. All that means that they may click elsewhere on your landing page, and then be lost from the funnel you had expertly planned for them. 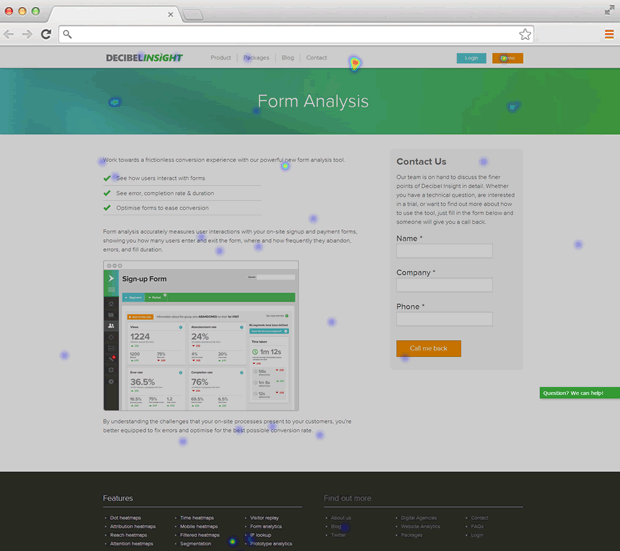 Dot heatmaps can show you where your users are clicking on your landing page. If a single element is competing too fiercely for clicks with your CTA, it’s time to rethink it – by repositioning it, redesigning it to draw less attention, or removing it altogether. The chances are that your landing page will contain a little more content than simply a CTA. After all, while you want your visitors to convert, you know that they might require a little persuasion. The problem with that additional content is that it can drag your visitor’s eye away from your CTA – and once dragged away, you may never get that attention back. Attention heatmaps show the parts of the page your users spend the longest time dwelling on – effectively measuring the attention paid to content on the page. If your content is dragging attention away from your CTA, then a rejig could lead to improved conversion. Try testing CTA placements next to, directly above and directly below the most-focused-on content. Scrolling. It’s a contentious issue. Whether you believe that visitors are happy to scroll through long pages, or are a keen fold-watcher, it’s indisputable that the further down a page you go, the more visitors will drop out – either clicking through to another page, or exiting your website altogether. It follows that you need your CTAs to sit in the optimal position on the page – far enough that visitors have absorbed some persuasive information about what you’re offering them, but not so far that significant numbers of them have started to press ‘back’ on their browsers. 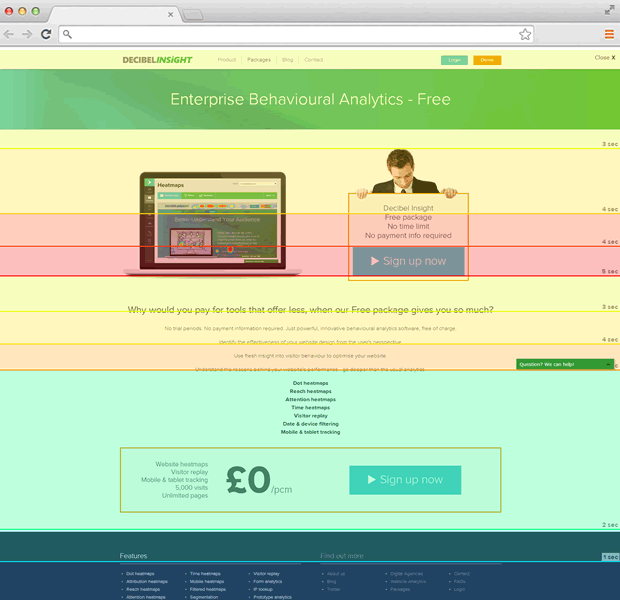 Reach heatmaps show how far down the page your visitors are scrolling before they exit, clearly quantifying the impact of page length and giving you a great insight into your visitor’s tolerance for scrolling – and therefore where it would be worth testing some different positions for your CTA. Phil is the Marketing Manager at Decibel Insight, based in their London HQ.